Adobe Reader required to read some of these files. “Uma teoria democràtica de educação em museu: Democracia e museus,” A paper prepared for the international conference, Diálogos em Educação, Museu e Arte, Porto Alegre, São Paulo and Recife, Brazil, October 2010. Translated into Portuguese by Gabriela Aidar and Milene Chiovatto. by G. E. Hein. This is an introductory chapter written in 2009 for Boston Stories: The Children's Museum as a Model for Nonprofit Leadership, a collaborative effort , led by former Boston Children's Museum director Michael Spock, that includes conventional text, photographs, and illustrations; as well as companion media and a fully searchable and downloadable digital archive. Publication is expected soon. by G. E. Hein, (2008) Taiwan Natural Science 27, 14-25. This article is based on two lectures delivered in Taipei, Taiwan, January, 2008. Click to download this article in Mandarin • . by G. E. Hein. In S. MacDonald (editor), A Companion to Museum Studies, Oxford: Blackwell Pub., 2006, Chapter 20.
by G. E. Hein, (2006) Professor Emeritus, Lesley University This condensed version of the talk, originally presented at Science Education for a Thriving Democracy symposium celebrating the 40th anniversary of the founding of TERC, November 2005, was published in Hands On!, 29 4-6,19, 2006.
by G. E. Hein, (2006), Professor Emeritus, Lesley University, J. Museum Education, 31 161-174. Click to read this article in Spanish • . Adapted from Passion and Pedagogy: Relation, Creation, and Transformation in Teaching, by E. Mirochnik and D. C. Sherman (2002). New York: Peter Lang, pp. 197-214.
by George E. Hein, Professor Emeritus, Lesley University. Presented at the Leicester University Museum Studies Conference, April, 1993, and published as Chapter 17 (pp. 189-203) in E. Hooper-Greenhill, editor, (1995) Museum: Media: Message, London: Routledge. Keynote address delivered at the Hands-On! Europe Conference, London, November 15, 2001, and published in Proceedings, Hands On! Europe Conference, 2001, London: Discover, pp. 35-42. “Informal Science Supporting Education Reform: Theory and Practice/Beliefs and Actions” by G. E. Hein, Keynote lecture delivered at the Fifth Annual Northeast Informal Science Education Network (NISEN) Conference, Building Bridges 2001: Informal Science Supporting Education Reform, Worcester, MA September 24, 2001. “Is Meaning Making Constructivism? Is Constructivism Meaning Making?” by G. E. Hein, The Exhibitionist, 18 (2), 15-18, Fall 1999. 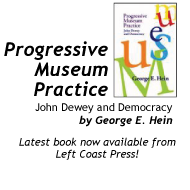 “The Constructivist Museum” by G. E. Hein, Journal of Education in Museums, 16, 15-17 1995. Click to download this article in Italian . “The Maze and the Web: Implications of Constructivist Theory for Visitor Studies” by G. E. Hein, Keynote address, Visitor Studies Association Annual Meeting, Birmingham, AL, July, 1997.
by G. E. Hein, in The Museum and the Needs of People, Haifa: Israel National ICOM Committee, 1992. Read this paper on-line at the Exploratorium's web site. Contents of this page ©2010 by George E. Hein. Contents may be quoted with proper attribution.